Nothing will Jazz Up your look like a Fedora. 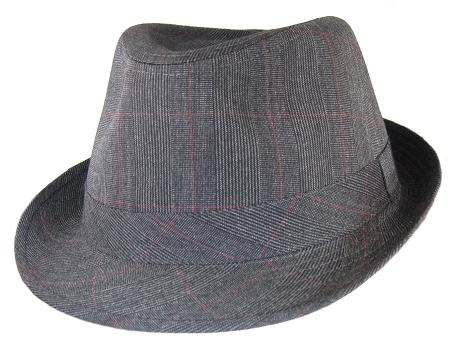 This 3XL Black Plaid Fedora is made up of black, gray and a tiny bit of red. The products (I bought a Fedora and a Baseball Cap) were both good quality. Customer service was excellent - I slightly messed up on Fedora hat sizes (apparently they are designed to sit more on the back of the head than I'd realized), but after a friendly phone conversation Big Head Caps graciously sent me the next two sizes up, along with a return label for the one I didn't need. So, although the prices are not low, the quality is good and the company are committed to having happy customers, so for me that is well worth paying for. Will definitely use again! Finally found hats that fit.... Great quality, great hats, great!!! Very nice, light, looks good with most looks. Great fit for a big head too. Have ordered 5 or 6 hats and they are all great. Fit my big noggin' perfectly. The fedora looks great and is exactly what I was expecting. Thanks!